Those who say we encounter crossroads in life are idiots. I know no one who walks a straight line for years then suddenly hits some great, game-changing T in the middle of the road. Instead, the crossroads and forks and dead ends come fast and furious most days, one after the other. Others sneak up on us as we’re on cruise control, dozing at the wheel. The daily in and out of breathing, living, being, mocks us. It tells us one week we are on a calm and determined path, and the next that we are certain of near death from sheer exhaustion and stress. I can think of no greater sad sack in this regard than me. It seems that every month or so I email my prayer team friends, saying that my husband and I are at a “great time of change.” A time of important decision-making. That we feel the winds of change a blowing’, taking our lives somewhere we never anticipated they’d go, but we just know—know!—that God has “A Plan for Us.” And my friends smile and nod across our virtual divide; “praying!” they write on our private Facebook page, followed by cute emoticons. But I know they must be rolling their eyes at yet another of my “crossroads” moment, coming mere moments after the last. God gives us much more than crossroads. He gives us sinewy snakes and wiggling vines and magic trick glasses that tease us into thinking they’re half full, right before convincing us of their emptiness and that He’s leaving us to die of thirst somewhere just past the last gas station in a 100-mile radius. “There’s always something!” They say with a nod and a smile, all but patting me on my sweet little head. And I see that this is true. I see it among my older friends, my family. Those in my church, and the people who I’m somehow friends with on Facebook although we’ve never even met. Sometimes it’s for cancer. Sometimes a sick dog. Other times the death of a child. But always, always, it’s something. Really, it’s kind of funny if you think about it. On one of your darker days, when all the humor you can muster comes straight from the gallows and you haven’t yet showered by 4pm, if you can step outside yourself to look in, you might see a little humor shining through. We’re all so chaotic, convinced we’re neurotic and that everyone else is better than we are, while at the same time thinking snidely of all the ways our neuroticism is superior to that of others—it’s really quite absurd. We’re all so desperate. Desperate to unplug, to declutter, to simplify, to keep Sabbath, to be less judgmental, to eat less sugar, to self-improve while also accepting ourselves just as we are. And all the while we’re hitting T after T in the road, convinced that each is the best and last and hoping our insurance covers whiplash. My good friend’s son just died. He lived slightly less than one year, and each day was torture. Torture for him, for his family, and surely for a God who doesn’t enjoy seeing good people suffer. Those of us who cared were tortured, too. We wanted so very much to take the pain away but couldn’t. So instead we cooked and cleaned and babysat and called (or didn’t call) and texted (or didn’t text). Whatever we could do, we did. But her son died anyway. My son died, too, also not making it quite a year in this curveball world we live in. And to this day, they are both still dead. So yes. There’s always something. It’s true that some of us have more “something” than others, but it’s also true that some of us just hide it better. Me, I’ve gotten to a point where I barely hide anything at all. To be sure, I spent one of my life’s many vignettes doing just that, but now… I write. For two years now I’ve put my whiny words to electronic paper, or sometimes its my perceived wisdom and wit, hitting the little button that says “Publish,” sending my very essence out to the few folks who actually take the time to read about it, which always surprises me. Many of my friends do this, too. We’ve joined up our little bloggy selves into a little bloggy sphere in which you will find us high-fiving and fist pumping and in general being the mutual admiration society for one another’s words. And, occasionally, one of us will hit a larger audience than ourselves, something that feels good and gives hope to those of us who are convinced we can’t go on living unless we’re a) better understood, b) teaching a life lesson we’ve learned in all our infinite wisdom, or c) making someone laugh at the quirkiness of our kids and personal lives. Even better is option d—helping others feel understood. Most of my friends write about God and Jesus. I do, too, but not like they do. They teach lessons. They have studied and learned and applied good things and strong principles to their lives and really, really want to teach others to do the same. Me, I just ramble. Funny thing is, those few writings in which I do impart something I’ve learned are much more widely read than the ones when I write about, say, my youngest’s latest foray into potty training. Go figure. But what I’ve also found among those who miraculously keep coming back is that they read not for a lesson, but because they love to see my “something,” and know that I might just understand their “something” too. And they’re right: I do. I’ve got very little to teach and even less wisdom to impart, but life-ache and absurdity and hilarity in the trenches? Those I’ve got those in spades. And the answers? Some of them I have, others I don’t. Some answers are only known by the creator of this universe, and maybe someday I’ll find them out. So much of life is about waiting to find out. I often don’t even know I’m on a exploration or scavenger hunt or deep-sea diving excursion until the thing or place or coral reef I didn’t even know I was looking for jumps up and hits me in the face. Or lightly taps me on the shoulder, which is sometimes even worse: a whispered word I’m not quite sure I heard, or heard correctly. It’s the misery of “if”: If this, then that. If not this, then that. He lives but he doesn’t. I suffer but you don’t. So there’s pain is in the telling. So what? There’s also catharsis. More importantly, there’s sharing. Telling is talking; sharing is giving someone part of you, hoping it benefits part of them. As ironic as it may seem, sharing the hurt and the grime and the rise from the ashes that you simply know you didn’t deserve but somehow got anyway is actually very good for the soul. Mine, yes, but hopefully too for the souls of others who need to hear of things equal to or greater than or less than all that they are and will ever be. And so here we are, in the telling. When I can, if I can, you will find that telling here. In bits from larger projects (books!) I’m working on, no chronology needed, hopefully each piece standing—a little wobbly maybe—on its own. If you think they’re worthy, I’d love if you shared them with others. And if you have thoughts on these excerpts I’d love to hear them. Happy two-year anniversary to me. Not to be too dramatic or anything, but thanks for being here with me. 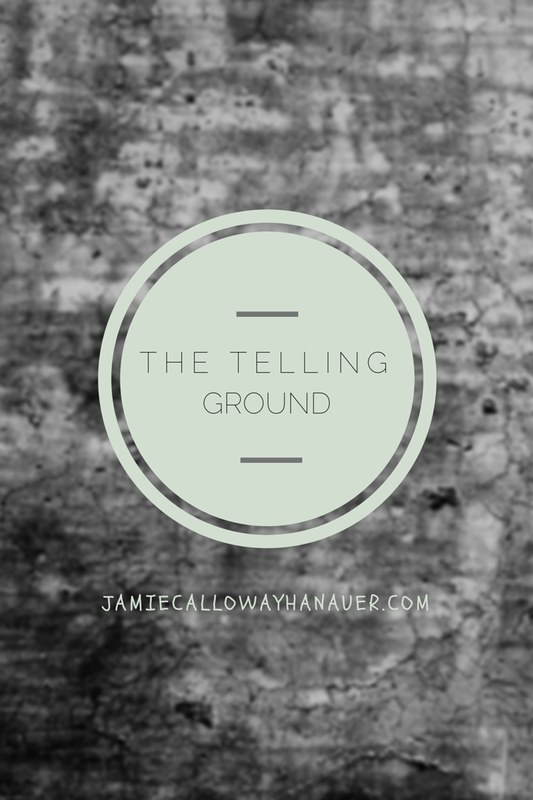 This entry was posted in excerpt, Let's Do This!, The Faithful, the telling ground and tagged blogging, book writing, essays, excerpt, the telling ground. Bookmark the permalink. I love your comments. They often break my heart, make me angry (not at you! ), and leave me frustrated (to say the least) with how screwed up our legal system is. But I nonetheless love them because they also make me feel loved, and cared for, and, primarily, that I have a friend in time of my own need who will understand my trials and tribulations, but also the joy of living in the fullness of life. My prayers are, as always, with you and yours. Blessings. I love this SO MUCH, Jamie. So much. (but of course: I’m one of those bloggy friends you mentioned who cheers on your words.) So much wisdom and truth here, and so much “me too”. Indeed you are. One of the best, as a matter of fact. Your transparency has given me insights I have needed for my own family. That you have left your lawyering to do something more expansive that will inevitably reflect Jesus is a beacon of hope. You make me feel understood. Our youngest son — the shy, gentle one so much like his sister who abandoned the family — is going to jail again, having been offered a Hobson’s Choice of two plea bargains. Two. That in itself is unheard of and “fishy.” The only choice that is meaningful to him — because he doesn’t give a damn what people think of him and it hopefully will put him in a position to be with his kids again soonest — will require him to perjure himself again: to plead guilty to an assault he did not commit. In fact, he was the one assaulted. As he has been for four years by his mentally ill partner. The police “evidence” was biased and full of lying innuendo. Even she, the assaulter, tried to keep the police away and refused to be photographed. The police photographed him but failed to mention they had, or any of his injuries, at the bail hearing. They insinuated that the blood all over him and his partner was hers; it was his. He is steering a very rocky course through an impossible legal quagmire while enduring emotional torture. The Toronto attorney I talked to yesterday (a second opinion) has no moral qualms whatever about advising him to take the short route to his kids, perjury or not. In 25 years, the lawyer has never heard of someone being offered two pleas bargains (1) one that he could take to a trial that would exonerate him but jail him longer for breaches (mostly for contacting his ex and his children) and (2) another where he perjures himself and gets out sooner with no probation. I struggle to fathom what’s going on behind closed doors. I am furious that the CAS system, which not only drugs kids in care but kills them (I have documentation), and that the legal system and the policing are so corrupt and deadly that he is making the best possible choice that will both unjustly brand him as an abusive male and send him to jail again. He who tolerated continual assaults without retaliation or even self-defense! Who had 80% of the care of their kids because of his partner’s mental illness! Of course, this gives the police carte blanche — and judges “court blanche” — to treat him in future as a dangerous man and to similarly persecute other males under an unconstitutional law and unconstitutional bail policies. Two of our sons have already been unjustly targeted by the police, this one since childhood. And, no, he has not done everything right or perfectly because he is like all of us imperfect. Bless you for what you do and don’t do, Jamie. For your passionate beliefs. For your reasoned approach to the unreasonable. For knowing that we have only Jesus in the dying, the persecutions, the tumultuous living.